Posted on 03 March 2010 by Steve Thoms. Canada is in line to get a big boost in both star and science power: famed Cambridge professor and Star Trek alumni Stephen Hawking has made plans to move to our “humble” country to take a research position this summer at the Perimeter Institute for Theoretical Physics, of the University of Waterloo. Professor Hawking considered making the move once before in 2008, following a series of science budget cuts by the UK government. Further pressuring Hawking to move was Neil Turok, a colleague of Hawking, who has already crossed the pond and has assumed the role of Director of the Perimeter Institute. The assumed move comes as a bit of a shock to Cambridge University, who had something different to say, “Professor Hawking has no plans to leave Cambridge at present. However, he will be a regular visitor to the Perimeter Institute for research purposes”. 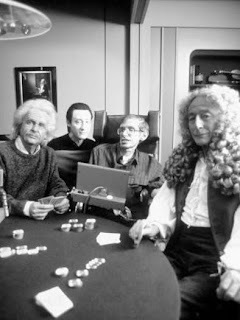 Hawking has held the Lucasian Chair of Mathematics for 30 years (retired from the post in October 2009), joining such historical luminaries as Sir Isaac Newton, Charles Babbage, and Lieutenant Commander Data. What could cause perhaps the greatest theoretical physics mind in the world to leave one of the most prestigious academic posts in the world? In long: anger at several years worth of drastic budget cuts by the UK government to pure science research. While Canada’s science community would stand to benefit greatly from the arrival of Hawking, his reasons for leaving the UK are symptomatic of a much larger, and concerning trend in science research funding and direction. In Dec 2009, the biggest cut yet to UK science was announced: £600 million from higher education and science and research budgets (page 110), and experts and political observers generally expect tens of millions more on the way in the near future. Indeed, the UK government now invests in pure science at levels comparable to the days when Margaret Thatcher was Prime Minister. The prospect of Hawking working in Canada notwithstanding, Canada also faces drastic cuts to science, including a $113 million reduction in research funding over the next 3 years. The new budget proposes $488.5 million for the Canada Foundation for Innovation, but with the stipulation that research be prioritized at the Industry Minister’s discretion. Furthermore, an unspecified amount has been promised for business-related degrees. I’ll repeat that: Canada’s Minister of Industry (not science), Tony Clement, will be dictating how the lions’ share of funds will be distributed, and another lump-sum will be shifted away from science (and the humanities) and into business education. What is happening in this process (in the UK and Canada) is a re-prioritization of what science should be doing. Both countries face an aging population, climate issues, and a troubling economy, so the states have decided that saving money is a priority, as is spending what money there is on specific goal-oriented projects. This treats science more as an engineering problem than a scientific one. If Queen Victoria had ever called an urgent meeting of counselors, and ordered them to invent the equivalent of radio and television, it is unlikely that any of them would have imagined the path to lead to the experiments of Ampere, Biot, Oersted and Faraday, four equations of vector calculus, and the judgment to preserve the displacement current in a vacuum. They would, I think, have gotten nowhere. Canada does not have a Minister of Science, but instead has a Minister of State for Science and Technology (who is a former chiropractor, acupuncturist, and current borderline creationist). The role of a Minister of State is not to write/design policy, but rather to advise the Prime Minister and inner cabinet Ministers who do write policy. In the case of the recent science budget, we have a decidedly pseudo-scientific adviser making recommendations to a minister whose primary function is of economic and corporate development. With the Canadian and UK governments treating science like expendable resources that are at the mercy and service of the economy, science is being pursued less for its own sake, and more for the sake of a specific problem set, usually in a thought process that resembles something like, “We have problem X. Insert science! If science can’t fix X, remove science! (or in the case of climate change in Canada, ignore X)”. ‘Problem X’ in Canada can be an aging population, diminishing fish stocks, climate change, low employment rates, or a stagnant economy…it doesn’t need to be a scientific problem for politicians to attempt to throw science at it. When science is pursued for its own sake, when scientists are free to explore the questions that nature provides, the end results may not be immediately practical, but they often prove to be very fruitful, even life saving. While it’s popular and funny to make jokes about useless particle accelerators and telescopes (IN SPACE! ), the science that comes out of such projects gave us trivial things like the iPod and cell phone cameras, and life-saving things like the ability to target cancer cells inside a brain. Oh, and the Internet? That was invented by the same organization that runs the Large Hadron Collider: CERN. Also, when science funding is cut, there is often the assumption (as was made by both the UK and Canadian governments) that those students who would go into science would go into a different (read: more profitable) field, such as engineering or business. But sadly, what happens is a brain-drain (hence, Hawking choosing Waterloo, which gets most of its funding from the provincial government, not the federal). Students who are interested in the big bang don’t want to study accounting, and if they’re able, they go somewhere that they can study what they want. Unless UK science is shielded from this [funding] reduction, the country would not be able to address the energy, climate change, water, health and overall sustainability challenges ahead. Worse still, the most able scientists would join the ‘brain drain’ across the Atlantic, and leave the nation even more vulnerable to industrial and societal decline. Science for its own sake is the drive of science. Scientists and researchers sometimes stumble and tumble their way into discoveries that save and extend lives, enhance our understanding of everything that is knowable, and yes, help the economy. The fact that we can’t always predict the outcomes of science is part of what makes it worth pursuing. 1. Sagan, C. (1996). Demon Haunted World: Science as a Candle in the Dark, pp. 394. Ballantine: New York. Interesting article Steve, one point of clarification, the Internet was developed by DARPA, a US funding body devoted to military / defense research. The ‘World Wide Web’ (as a set of useable protocols anyways) was developed by Tim Berners Lee, while he was working at CERN. ‘ The Dream Machine: J.C.R. Licklider and the Revolution That Made Computing Personal ‘ lays out the fascinating story of the development of both the computer revolution, and the internet. One fascinating point, the development of both, if they had been left purely to private industry of the time, may not have occurred. And yes, in the development of both, there was a great deal of stumbling and tumbling around. A great deal of play, even.